Generally speaking, the European settlers in North America coined the phrase 'Indian' or 'Red Indian' to describe the Native North American tribes they found while they were settling what is now the USA. To the north of this vast collection of varying regions and climates were the native settlements of what is now Canada, while to the south were the various peoples of modern Mexico, most especially the Aztecs. The Mahican confederacy was located on the eastern seaboard, in modern Connecticut, Massachusetts, New York, and Vermont, with their neighbours to the north being the Abenaki and Iroquois, while to the east were the Wappinger and Pocumtuc, to the south were the Lenni-Lenape (the Delaware and their divisions the Munsee and Unami), and to the west lay the lands of the Mohawk (part of the Iroquois confederacy). The Mahican are commonly mistaken for the Mohicans, thanks to James Fenimore Cooper's literary classic of 1826, Last of the Mohicans. The tribe's original home was along the Delaware River, which they named the Mahicannituck. They called themselves the 'Muhhekunneuw', which translates as 'the people of the waters that are never still'. Because others found their name difficult to pronounce they settled on 'Manhigan', the Mahican word for 'wolf' and the name of one their most important clans. In later years, the English altered this into the more-familiar Mahican or Mohican. The French name for the Mahican was 'Loup' (the French for 'wolf') and followed a similar reasoning. However, their name is a source of some confusion, as a similarly-named tribe - the Mohegan - lived some 160 kilometres (a hundred miles) away, and were also of the Algonquian linguistic group. This confusion is, in part, due to James Fenimore Cooper's novel. His eponymous hero, Uncas, was in reality a Mohegan sachem (leader). The Mohegan were related by language to the Mahican group and both have been called Mohicans, hence the confusion. Apart from that language connection, the two tribes seem to have sprung from entirely separate origins. The Mahican stock was Algonquin, from the Algonquian-Ritwan-Kutenai superstock. The Algonquian linguistic group covered a wide area, from Newfoundland and across Canada via Hudson Bay; to the far south beyond the Great Lakes; to the Eastern Seaboard; and with an isolated enclave on the borders of the south-west and the southern plains, encompassing the Cheyenne and Arapaho lands. The Mahican were a confederacy of five groups living along the Hudson River valley of Upper New York State, and hence were known as 'the River Indians'. These five were the Mahicans and the four lesser-known groups listed below. The Mechkentowoon lived along the western shore of the Hudson River, above the Catskill Creek. The Wawyachtonoc (otherwise shown as the Wawayachtonoc or Wawyachtonok) were the 'eddy people' or 'people of the curving channel', lived in what are now Dutchess County and Columbia County, and ranged eastwards to the Housatonic River in Litchfield County, Connecticut. Their main village was Weantinock, with others at Bantam, Pamperaug, Scaticook, Shecomeco, Weataug, and Wechquadnach. The Westenhuck name comes from 'hous atenuc', meaning 'on the other side of the mountains', which was the name of a village near Great Barrington, Massachusetts. Often called the Housatonic people, they lived in the Housatonic Valley in Connecticut and Massachusetts and in the vicinity of Great Barrington, which they called Mahaiwe, meaning 'the place downstream'. The Wiekagjoc name originated in the word 'wikwajek', meaning 'upper reaches of a river', and they lived to the east of the Hudson River near the city of Hudson, Columbia County, New York. The Mohegan migrate east as part of the Pequot and settle in eastern Connecticut at a point around this period in time, while the Mahican remain in the Hudson Valley. These two tribes follow separate paths and seem to have sprung from separate sources, despite their language connections and the proximity of their early settlements to one another. Some modern scholars postulate a shared origin, but there is nothing to prove this. The English explorer, Henry Hudson arrives in Mahican territory in September 1609 where he encounters Mahican villages just below Albany (a little south of the line of modern Vermont's southern border). The Mahican are not only friendly but eager to trade. Hudson exhausts his trade goods and returns to the Netherlands with a cargo of valuable furs which immediately attracts Dutch merchants to the area. The first Dutch fur traders arrive on the Hudson River (named after Henry Hudson) to trade with the Mahican. Besides exposing them to European epidemics, the fur trade destabilises the region and, rather than prosperity, it brings to the Mahican death and destruction. At first, the Dutch traders come only in the summer, load up their ships with fur, and then sail back to Europe. By 1613 the fur trade on the Hudson River has grown so lucrative that it becomes organised, and the United Netherlands Company, a consortium of thirteen Dutch merchants, is granted a four-year charter by the staten generaal. It is decided to establish a permanent trading post, but the Dutch first have to arrange a truce to end the fighting which has erupted between the Mahican and Mohawk. Once the Mahican-Mohawk truce has been put in place, the Dutch build Fort Nassau on Castle Island in 1614, just south of modern Albany. This is mainly intended for fur trading. Also in 1614, the Dutch found a commercial trading post on the eastern coast of North America and name it New Amsterdam (it had originally been named Nouvelle-Angoulême by Giovanni da Verrazzano, when he had reached the region for France in 1524, in the first tenuous steps towards establishing New France). English traders try to lure the Mohawk away from the Dutch with offers of firearms. To counter this, the Dutch reverse their previous policy and begin selling large guns and ammunition to the Mohawk and Mahican to whatever amount they want. Not only does this dramatically escalate the violence in the Beaver Wars (otherwise known as the Iroquois Wars) in the St Lawrence Valley and Great Lakes, it also upsets the balance of power along the lower Hudson. The subsequent Wappinger War against the Dutch spreads to include warriors from at least twenty tribes, including many sub-tribes of the Unami (and possibly some of the Munsee) west of the Hudson; the Kitchawank, Nochpeem, Sintsink, Siwanoy, Tankiteke, Wappinger, Wecquaesgeek from east of the Hudson; and also many of the 'Metoac' tribes of Long Island. With only 250 men against 1,500 warriors, the Dutch are in danger of being overwhelmed. However, the Mohawk and Mahican remain loyal, and Governor Kieft is able to sign a treaty of friendship and trade with them at Fort Orange. The Mohawk and Mahican do not intervene in the fighting, but the very possibility that they might is enough to keep tribes from joining the Wappinger. The situation worsens with the commencement of twenty years of death and destruction for the Lenape. After the murder of a Jesuit priest, war resumes along the St Lawrence between New France and the Iroquois. At the same time, the Western Iroquois (Cayuga, Onondaga, and Seneca) attack the Susquehannock which, of course, draws the Munsee and Lenape into the fighting as Susquehannock allies. Meanwhile, the Mahican have ended their alliance with the Mohawk (in 1655) and have gone over to the side of their enemies in western New England, this being a French-inspired alliance of the Pennacook, Pocumtuc, and Sokoki (western Abenaki). Forced to fight this many wars, the Iroquois come to the Dutch and demand help. The Dutch promise arms and, in one of their few positive accomplishments in the year, convince the Mahican to desert their New England allies and make peace with the Mohawk. 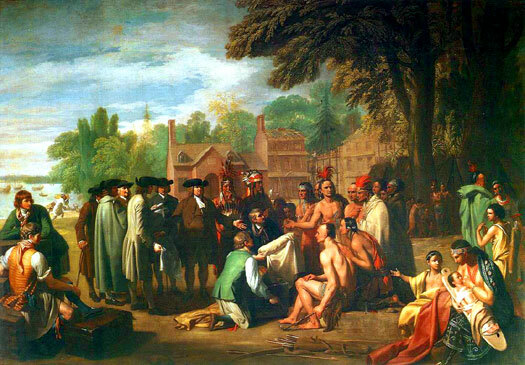 Chef Pinna of the Passyunk Lenape agrees a treaty of peace with Governor Philip Calvert of the British Colony of Maryland. There have already been some skirmishes with the English colonists in Maryland between 1658-1661, but this is resolved by the treaty and Maryland's subsequent aid to the Susquehannock in their war with the Iroquois. However, the treaty forces the Esopus to surrender most of their land in the valley, which does not sit well. Only the threat of war with the Mohawk and Mahican keeps the agreement intact, but the Mohawk learn that the Mahican are once again trying to arrange trade between the Dutch of New Netherland and the Sokoki (Mohawk enemies), and another Mohawk-Mahican war erupts in 1662. It rages until 1664, when the Mohawk are finally able to overcome their perennial opponents. By this point the Mohawk have driven the weakened Mahican east to Massachusetts. Their complete dispersal is hastened when their enemies are armed by the Dutch. Mortally wounded by four free blacks during a visit to Albany. The Iroquois relent somewhat and allow three hundred Susquehannock to return to the Susquehanna Valley in Pennsylvania. No longer a powerful people, they become known as the Conestoga (from the name of their village). The Iroquois keep a watchful eye on them and use their homeland as a kind of supervised reservation for the displaced Eastern Algonquin and Siouan tribes (including the Conoy, Delaware, Mahican, Munsee, Nanticoke, Saponi, Shawnee, Tutelo, and also the New England Algonquin), who are allowed to settle there as members of the 'covenant chain'. Quaker missionaries arrive and make many conversions amongst the Susquehannock. As Conestoga becomes a Christian village, the more traditional Susquehannock leave - either returning to the Oneida in New York, or moving west to Ohio to join the Mingo. Visited England's Court of Queen Anne with three Mohawk chiefs. The 'Four Mohawk Kings' or 'Four Kings of the New World' are in fact three Mohawk chiefs of the Iroquoian confederacy and one Algonquian-speaking Mahican. The first of the three Mohawk is Sa Ga Yeath Qua Pieth Tow of the Bear Clan, called 'King of Maguas', with the Christian name Peter Brant, grandfather of Joseph Brant. The second Mohawk is Ho Nee Yeath Taw No Row of the Wolf Clan, called 'King of Canojaharie', or John of Canojaharie ('Great Boiling Pot'). The third is Tee Yee Ho Ga Row, meaning 'Double Life', of the Wolf Clan, called 'King Hendrick', with the Christian name Hendrick Peters. The one Mahican is Etoh Oh Kaum of the Turtle Clan, labelled - quite erroneously - in his portrait as 'Emperor of the Six Nations'. It is these four First Nation leaders who visit Queen Anne in England in 1710 as part of a diplomatic visit that is organised by Pieter Schuyler. Five set out on the journey, but one dies in mid-Atlantic. It could the 'King of Maguas' who provides the inspiration for the Magua of James Fenimore Cooper's Last of the Mohicans. First known under the name Housatonic, the Stockbridge Indians were a tribe of the Mahican confederacy. 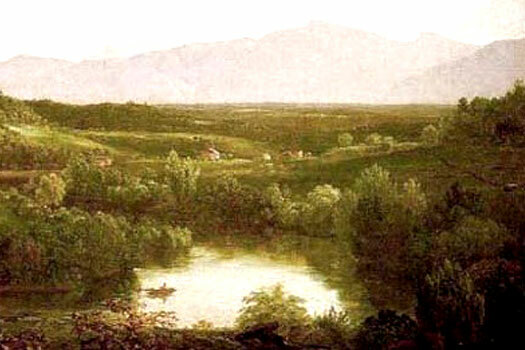 They occupied part of the valley of the Housatonic River, in the southern part of Berkshire County, Massachusetts. After the the 'Council Fire' was removed from the village of Schodac, the Housatonic village of Westenhuck became the main Mahican settlement. In 1734, two years after the commencement of missionary work amongst them, the various bands were collected together on a tract of land that had been reserved for their use by the colonial government. After the village of Stockbridge was established they became known as Stockbridge Indians. The name Brotherton was given to two distinct bands, each of which was formed of remnants of various Algonquian-speaking tribes. The best-known band was composed of individuals of the Mahican, Mohegan, Narragansett, Pequot, Wappinger, and others of Connecticut and Rhode Island, together with the Montauk and others from Long Island. All of these remnants settled in 1788 on land given to them by the Oneida at what is now Marshall, Oneida County, New York, near the settlement that was then occupied by the Stockbridge. The second band that used the Brotherton name was composed of Raritan and other divisions of the Delaware who, according to E M Ruttenber, occupied a reservation called Brotherton, in Burlington County, New Jersey, until 1802, when they accepted an invitation to unite with the Stockbridge and the other Brotherton bands which were living in Oneida County, New York. In 1832 the forty-or-so remnant members were officially recognised as Delaware and claimed territory to the south of the Raritan as their ancient home. Their descendants are probably to be found among the Stockbridge in modern Wisconsin. From 1720 on, the diminished Mahican begin to move west to join multi-ethnic groups, first on the Susquehanna and then to the Ohio country. In 1738, the Mahican give missionary John Sergeant permission to start a mission in the village. Eventually, the European inhabitants gave this place the name 'Stockbridge', after a village in England. This is located on the Housatonic River, near a great meadow that is bounded by the beautiful Berkshire Mountains in western Massachusetts. In this mission village, a church and school are built. The Mahican and other native people who have relocated here became known as the 'Stockbridge Indians'. Others resettle first in Stockbridge, along with the Housatonic in 1736, and then after 1756 they move to New York and finally in 1833 to Wisconsin. Here the combined Mahican-Wappinger-Housatonic federate into the Stockbridge and obtain a reservation near Bowler, Shawano City, where several hundred natives of mixed Stockbridge and Munsee heritage remain to this day. A few Mahican remain in the Hudson Valley where a number of modern rural groups claim ancestry from them. Hausotonok Mahican. Sold Housatonic land. Konkapot sells one large section of land on the Housatonic for £460. Payment also includes three barrels of Sub-Chief Umpachene cider and three quarts of rum, presumably to ease the pain of his decision. First Mahican to be baptised. The Fourth French-Indian War erupts, starting with the Battle of Great Meadows. The war proves disastrous for the Stockbridge. Many of them join the armies of the British and their town suffers from attacks by marauding parties. At the close of the war there are only about two hundred Stockbridge remaining, with white settlements beginning to close in around them. Son. Fought in the War of Independence. Councillor in 1777. After a meeting with the 'Patriots' of the Continental Congress at Boston in April, Captain Hendrick Aupamut of the Mahican decides not to follow the advised path of neutrality in the approaching war and instead joins the rebels. Nimham's Wappinger follow suit. The Stockbridge Mahican are one of the few tribes to support the independence cause during the war. Between September and October, the First Congress considers its options and petitions King George in Britain for the redress of colonial grievances. 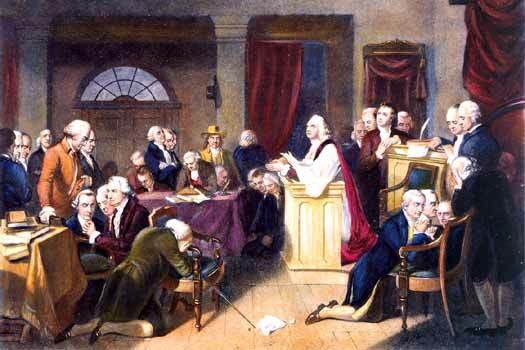 On 15 June, in anticipation of coming events, the colonial assembly of Delaware (which has its own native Delaware people) declares itself separate from British rule, backing the Continental Congress. The Stockbridge Mahican and Nimham's Wappinger participate in the Siege of Boston and fight at Bunker Hill on 17 June. They also see service at White Plains in 1776, act as scouts for the army of Horatio Gates at Saratoga, fight as a company-sized unit at the Battle of Bennington in 1777, and are at Barren Hill in 1778. Nimham is killed at the Battle of Kingsbridge in August 1778. For their service, the Mahican (Stockbridge) later receive a land grant in Vermont (which is subsequently sold). Unfortunately, the Stockbridge also pay a terrible price for their patriotism as the war costs them almost half of their adult male population. Joseph's three councillors are Peter Pauquaunauput, Hendrick Apaumat, and John Konkapot (also called John Stockbridge). Joseph is the son of King Ben's grand-daughter and brother-in-law to Hendrick Aupaumut who is himself married to Lydia Quinney. The dispirited remnants of the Stockbridge Indians accept an invitation from the Oneida, and remove themselves to a tract of land on Oneida Creek in Madison and Oneida County, New York, where a new village springs up. The removal requires two years. Under the protection of the Oneida, the Stockbridge again increase in number, and in 1796 their population has climbed back to three hundred. Around 250 individuals of the Mahican, Mohegan, Narragansett, Pequot, Wappinger, and other diminished tribes of Connecticut and Rhode Island, together with the Montauk and others from Long Island move to Oneida County and call their settlement Brotherton. They all go under the leadership of Samson Occum. the Indian minister. As their dialects are different they adopt the English language. The Stockbridge Mahican volunteer to be negotiators for the USA when it comes to talking to the tribes of the Western Alliance in Ohio who are at war with the United States. 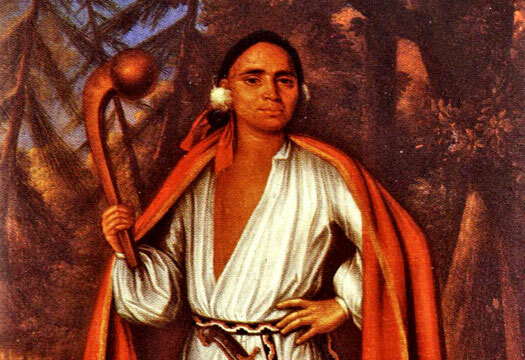 The Stockbridge delegation is led by Hendrick Aupamut in August 1793, but despite being heard in council with respect, the negotiations ended in failure and the war continues to its eventual conclusion at Fallen Timbers in 1794. The Miami and Shawnee are under the leadership of Michikimkiva during this last battle. By 1802 only a few isolated Mahican families continue to live along the Hudson. A mixed band of Mahican, Mohegan, Montauk, Narragansett, Pequot, and Wappinger have already moved to land given to them by the Oneida in New York, while a second group of forty or so Raritan-Delaware from a New Jersey reservation called Brotherton now join the first group. In 1833 the combined party moves to Wisconsin, with all of them now using the name Brotherton. In 1808 nearly one-third of the Stockbridge under the leadership of John Metoxin accept an offer made by their relatives amongst the Delaware and Miami and, in 1818, John leads a group that heads westwards to the White River in Indiana - amounting to around twenty-five per cent of the tribe's total population. 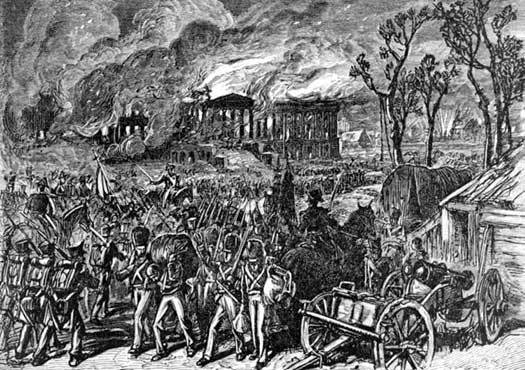 The War of 1812 begins as the USA declares war on Britain over the interdiction of trade with Napoleonic France, but the push to colonise Canada is repulsed several times, leading to defeat. Stockbridge and Brotherton Mahican warriors serve in the American Army during the war. Some Stockbridge continue on to Wisconsin, but many choose to stay and are joined later by a group of Munsee Delaware (this mixed group does not leave Indiana to rejoin the main body until 1834). Meanwhile, the remaining Stockbridge in New York sell their remaining lands in 1822 and agree to move with the Oneida and the Brotherton Mahican, to a new reservation in northern Wisconsin on lands that lie east of the Fox River which the US government intends to purchase from the Menominee and Winnebago. The Menominee change their minds about the amount of land they wish to sell, and it takes some time to negotiate a new agreement. After a new treaty is signed in 1831, the move by the remaining Stockbridge is completed by 1834, with the Oneida locating themselves just to the west of Green Bay, on land that has been purchased from the Menominee, and the Stockbridge and Brotherton Mahican settling on the eastern shore of Lake Winnebago. During the late 1830s the US government makes plans to send them to Oklahoma and Kansas. One group actually moves in 1839, but after suffering extreme hardship en route they do not adjust well to life on the plains and instead return to Wisconsin. By this time, the Stockbridge have decided that they had moved enough. However, serious internal divisions develop after the government offers citizenship if the Stockbridge end their tribal ownership of land. The majority of the Brotherton finally accept this offer in a treaty that is signed in 1856, while the Stockbridge, Munsee, and a few Brotherton move to a new 40,000 acre reservation to the west of Green Bay. These groups eventually form into one tribal body. Tribal ownership finally ends with the individual allotments that are prescribed by the General Allotment Act (the Dawes Act, 1887). During the twenty-eight years between the completion of the allotment (1910) and the formation of a new Stockbridge tribal government in 1938 under the Indian Reorganisation Act (1934), much of their land is lost either to tax foreclosures or sales to US citizens. Although only 16,000 acres of their original reservation remains today, the 'Last of the Mahicans' are still there and still very much alive.